The parish of Laragh was united with Drung for much of the medieval period became a separate parish C 1750. Upper and Lower Laragh became one in 1867. The first post-penal chapel in Laragh was built C. 1770 in the Townland of Munelta, while Fr Anthony Smith, a native of Carrickallen was parish priest. This church served the people of Laragh until 1839 when St. Brigid’s Church was built in the same townland. Fr Hugh Brady was parish priest at this time. Bishop James Browne presided over a famous temperance rally at which Fr. Theobald Matthew preached on 6 June 1841. In 2005 more renovation work was carried out while Fr Phil Brady was parish priest. The main hall was extended and a new crying room ‘St. Brigid’s Room’ was built inside the chapel. An office for the priest was built off the old crying room. In 2012 the Church was closed temporarily and was re-roofed. The church roof had been leaking for some time and bad summers stopped this worked from being carried out. Luckily enough we got a few weeks of midlin weather and the works commenced. Mass was celebrated in Laragh hall while the works continued. When the parish of Laragh was divided into Upper Laragh and Lower Laragh C.1790, it was decided to build a chapel to serve the new parish of Upper Laragh. The first Clifferna chapel was built in 1796 in the Townland of Cormeen. A stone from this chapel with the inscription ‘built by the Rev Edward McCormack AD 1796 has survived and is built into the wall of the present St. Michael’s Church. The chapel built in 1796 was described as ‘a long low thatched house’, a description which might accurately be applied to many chapels in the diocese at this time. The chapel must have been built of poor materials because it only lasted one generation, being replaced in 1821 by the present St. Michael’s Church. Fr Peter Lambe, a native of the neighbouring parish of Castletara was parish priest at this time. He secured a site in order to build a church in the Townland of Clifferna from the Church of Ireland Bishop of Kilmore, who was the local landlord. This chapel, which was built in 1821 was a solid structure built with stone and lime and roofed with slates. It was a T-shaped building with a vestry attached and could accommodate at least 500 people. Rev. Noel McIntyre CC carried our renovations to it in 1973 among which saw a re-designing of the sanctuary area. In February 2005 work was started to renovate the church. A new sacristy area and entrance porches were erected. The Grotto was relocated. The old ceiling was removed and replaced with a timber ceiling made in ash. Electro osmosis damp proofing was installed along with new electrical and heating systems. A new marble altar was also installed. Behind that are two new stained glass windows dedicated to St. Michael and one to St. Brigid. New PVC guttering, fascia and soffet were installed outside the church and the car park was layered with tarmac. 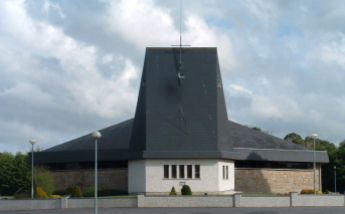 The church was re-opened for masses in Easter 2006 and was re-dedicated by Most Rev Bishop Leo O’ Reilly on June 4th 2006. This work was completed while Fr Enda Murphy was the curate and Fr Phil Brady was parish priest. Sunday 4th June 2006 was red letter day for the Clifferna community and the whole parish of Laragh. On that day St. Michael’s church was rededicated by Most Rev. Leo O’Reilly, bishop of Kilmore. The solemn liturgy was attended by a large number of clergy and the church was full to overflowing with parishioners and friends as well as members of the Church of Ireland community accompanied by their rector Rev Raymond Moore. In the sunlight of a beautiful summer day, one and all gave thanks to God for the completion of the works which saw St Michael’s church transformed into a warm, prayerful and beautiful place of worship. The work for the project was managed throughout by St Michael’s Church Committee. They decided from the out set that only the finest materials and the highest standard of workmanship would be acceptable. Hence the harmonious blending of stone and timber, marble and glass. A new ceiling was installed in ash, the internal walls were completely dry lined. New heating and electrical systems were installed, as well as new floor covering and seating. Two new porches were added at the front of the church and the building of an extension at the rear saw the provision of a sacristy and toilet facilities. The centre piece of the church is the new sanctuary area. This saw the installation of a reredos or high altar which was once situated in a convent in Kilkenny city. 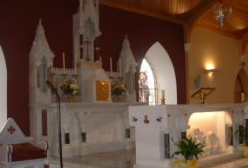 A new altar was constructed using parts from the original altar in the old Laragh chapel. A new presider’s chair and ambo were also fitted and the floor area of the sanctuary was covered in Turkish marble. The sanctuary ensemble is completed by the beautiful baptismal font which once stood in the Catholic Church in Portstewart, Co. Antrim. The new windows in the sanctuary area depict St. Michael and St. Brigid, the patrons of the Church and the parish respectively. Externally the plaster was removed and renewed and the car park completely resurfaced. In his homily at the rededications ceremony Monsignor Liam Bergin, rector of the Pontifical Irish College in Rome paid tribute to the people of all the townlands in the Clifferna area. H e linked the table of the altar to the tables in each home in the area, pointing out that the church is the place where the community gathers to be nourished and fed on God’s word and sacrament. After the ceremonies were completed all present were treated to a buffet supper, with a chance to enjoy some music and dance in a specially erected marquee. It was a truly memorable day marking the completion of a major renovation project. St. Michael’s Church stands as a testimony to the faith of previous generations and today it is a symbol of the living faith of today’s generation who have put in place one of the most beautiful country churches in the diocese. Not to us, O Lord, not to us, but to your name be the glory. May St. Michael’s Church continue to draw people to praise and worship God – may its walls be a safe shelter and place of quiet reflection, where the living stones of the church – God’s holy people can gather to glorify the Lord and thank him for the many gifts he has given. The population in the parish of Upper Laragh was very large in the pre-famine decades. St. Michael’s Church had been built in Clifferna in 1821 and St. Brigid’s Church in Lower Laragh in 1839 and people of the northern end of Upper Laragh felt that they were entitled to a church also. They saw Clifferna church as too remote and too small to meet their needs. In 1839 Bishop James Browne sent Fr Thomas Brady to be the first curate in Carrickallen. Now that they had a curate the people of Carrickallen were determined to have their own church too and in the early 1840s Bishop Browne gave permission for a church to be built there. The present St. Patrick’s Church was built in 1844 in Carrickallen townland. This church served the needs of the people who lived in the five townlands of Edrans, Greaghcrotta, Carrickallen, Drumcalpin and Tullyinchin. According to the census of 1841 a total of 954 people lived in these townlands at that time. The church was at first a plain rectangular building. Then in 1859 when Fr Philip Smith was curate another section was added to make it T-shaped.